The first working version of the Postcards feature. 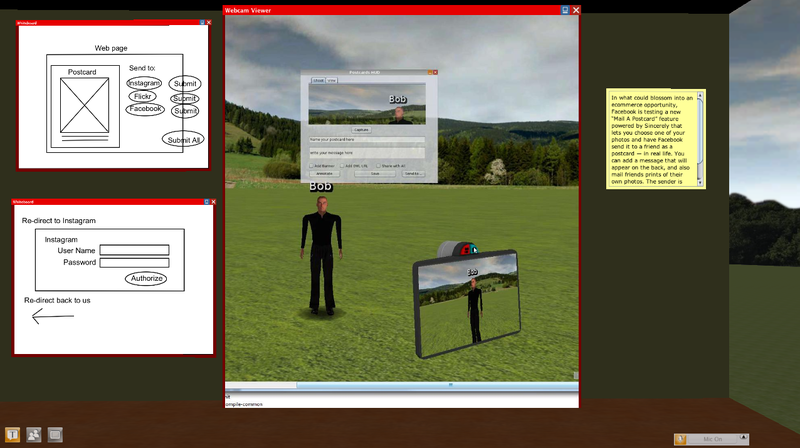 To create a postcard, the user positions an in-world camera and clicks on the green camera button to take a photo. A window then pops up with the photo (not quite displayed properly yet) and allows the user to type in a name for the Postcard and add a message. The user can then save the Postcard to their computer or export it to a photo sharing site. The whiteboards on the right side of the image show the rough design for the web app that will be used to export the Postcards to services such as Facebook, Flickr, Instagram, and others. The export piece is still a work in progress. During the two code-a-thon sessions, the group broke up into three teams. Two of the teams worked on coding while the third team worked on design and documentation. The documentation is in the form of a photo essay – really a screenshot essay – of the two code-a-thon sessions. Creating the Facebook photo essay as a mechanism for documenting the code-a-thon. If you click on the individual images in the Facebook Postcards album, you will see that each one includes a narrative explaining what the group was doing at that point in the project. 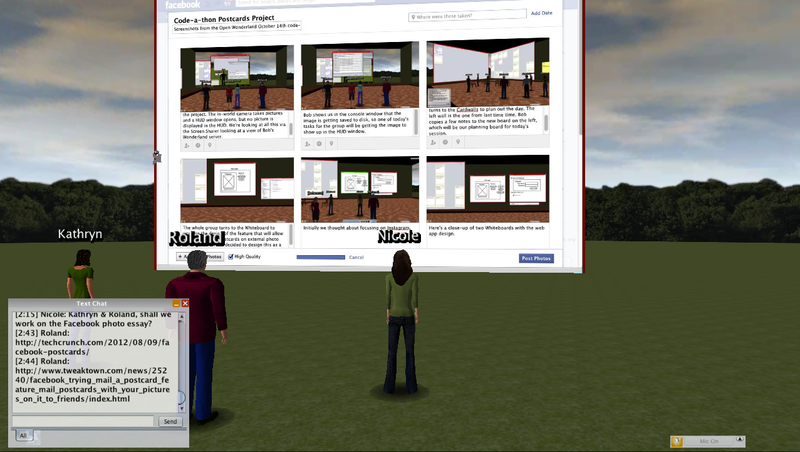 We used a wide range of Wonderland collaboration tools during the two sessions. We began by setting up several different Cardwalls to record “user stories” and track tasks. The design team made heavy use of Whiteboards to sketch out the Postcards UI design. 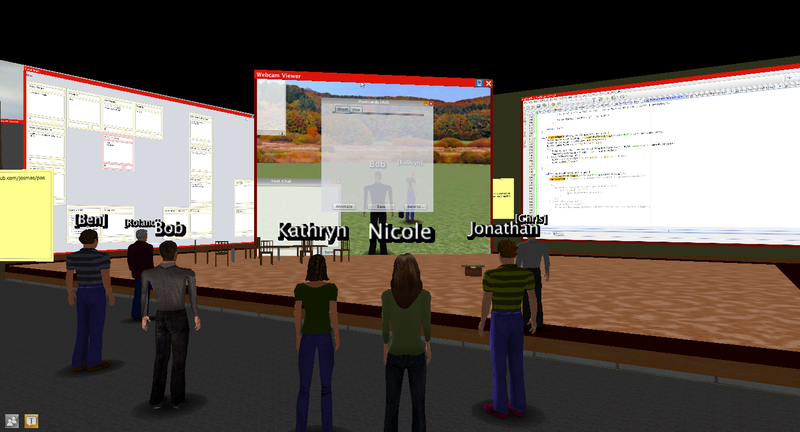 All the teams used the Screen Sharer to collaborate. The design team used it to work on the user interface document in Google Docs and also to create the photo essay on Facebook. The development teams used it to share terminal and web browser windows. 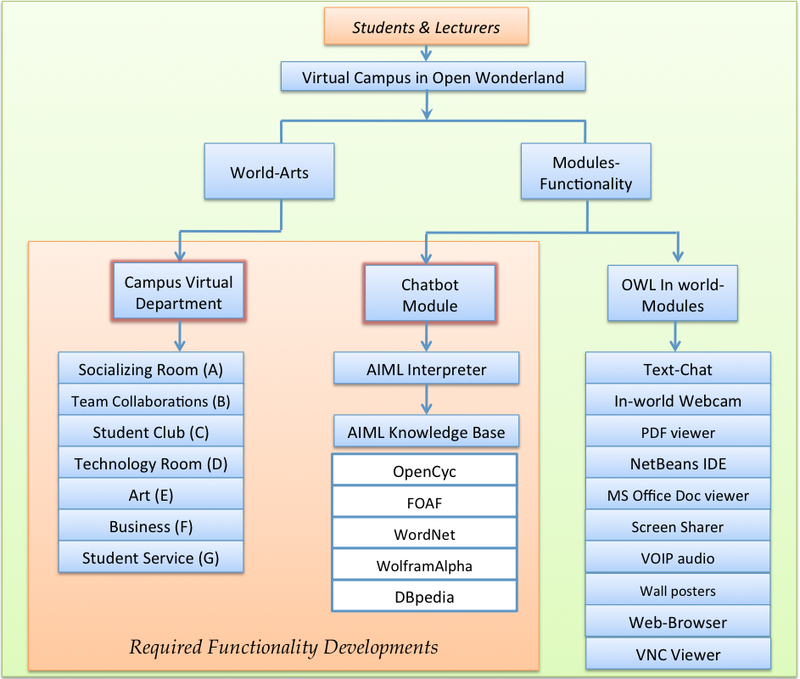 The development teams also used two in-world copies of the NetBeans software development environment, sticky notes, and VNC (a desktop sharing tool). The VNC session is what is visible in the first screenshot above. They used it to show Wonderland running on a remote test server. In this way, the group could use the main community server for collaboration and a separate server to install and test the new Postcard code. All the code developed for this project is publicly available in a Postcards github repository. I just came across a post on the Online Colleges Blog that I found interesting and thought others might as well. Despite the name of the blog, the article focuses on online learning in K-12 as well as the college level in eight states: California, Florida, Minnesota, Idaho, Ohio, Michigan, Wisconsin, and Arizona. 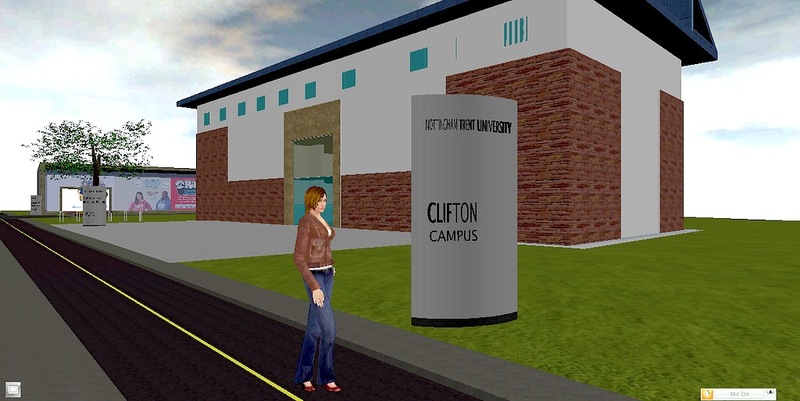 While there’s no specific mention of virtual world technology, programs such as the ones mentioned in these states might be interested in considering how virtual worlds compliment their existing online offerings. You are currently browsing the Wonderblog blog archives for November, 2012.